Dudley scooped first prize for innovation and development at the prestigious International EDGE Awards 2012 ceremony in Edinburgh. It was almost a double victory for the team as they narrowly missed beating a national website in the virtual category. The award recognised the team's innovative approach to shared delivery of services at Brierley Hill Library, with a housing office and citizen's advice bureau. The team was runner up in the virtual category for the online one-stop shop Dudley community information directory. "This project has shown what can be done to ensure the place of the local library at the heart of the community whilst still making the efficiencies that are demanded of us all. Brierley Hill Library transformed not only the building, but the services offered and the way that staff worked to create a successful thriving library." "This is fabulous news and the accolade is well deserved. It demonstrates the team's ability to modernise the service and tailor it to the needs of local people." Gary Flavell, National Sales Manager for Point Eight Ltd, who designed, manufactured and installed the new fitted furniture, including the shelving and counters, said: "The libraries team were very clear about what they wanted to achieve and we are delighted that we could help them realise their goals. The Edge Award is a testament to their vision and all of us at Point Eight are proud to be part of that." 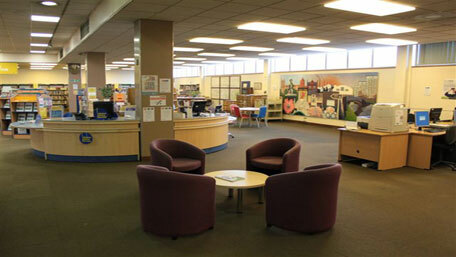 View the Designing Libraries database record for Brierley Hill Library.